The Liberal Party deciding to ignore the findings of the banking sector royal commission is borderline genius or plain crazy. Or both. Straight, forward-thinking man of Adelaide, Christopher Pyne, who is both the Minister for Defence as well as being the Leader of the House (and not for nothing, but he has never been seen in the same room at the same time as screen legend Gloria Swanson; I’m not saying they’re the same person; I’m not not saying it, either) got up nice and early on Sunday morning, had his Weeties and went on Insiders on the ABC. Agitprop leftist troublemaker Barry Cassidy asked Mr Pyne some questions about the recently released Banking Royal Commission report, basically asking if the government would be forced into implementing the recommendations of same. They are, after all, the government. Responding to the royal commission will take at least 40 pieces of legislation, Pyne admits, and given that the government has said that Parliament will sit for all of 83 seconds* between now and what most in the election forecasting business are figuring will be an electoral wipe-out for the fellows on the Right, there’s a paucity of time between now and the whenever-th of May to get the dirty work done. And by dirty work, we’re talking 76 recommendations of Kenneth Hayne’s final report, which are basically going to unsettle the financial services sector, to say the least. As it’s basically his job at this point to say everything’s Labor’s fault, and that Labor had every opportunity to do something about financial malfeasance when they were in power (*checks notes*) up until 2013, which is (*does the numbers*) six years ago now, Pyne took to Shorten’s crew with venom. I don’t think you could trust most of them to sit the right way on a toilet set, much less enact admittedly complicated findings in a complex business into even more complicated legislation in a legislative window so small you could barely fit Peter Dutton’s social conscience in it. Off-screen, Barry Cassidy did what he could to suppress his laughter, but failed, and milk came out his nose. The findings of the royal commission are all of this incredibly damning information about the banking sector. Stuff you really don’t want royal commissions to expose—stuff like charging fees for no service. And charging fees for no service to dead people. You know, common, garden variety grifter stuff. Stuff many in the nation knew was going on, but for reasons hitherto only speculated upon, which the Turnbull-Morrison-Whoever’sNext government opposed investigating, on principle, 23 times. Rank socialism, they cried (“rank socialism”, by the way, is my favourite kind of socialism, and my third favourite Billy Bragg bootleg). 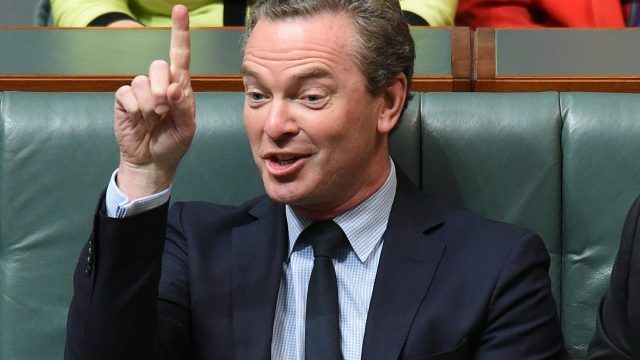 I can, on one hand, see some measure of strategy on Pyne, Morrison and the government’s part: on that hand, we have the fact that they’re all convinced they’re on the way out, and they don’t want to be the ones seen as responsible for what will have to happen to the financial services sector—in that you’re going to see a whole bunch of mortgage brokers lose vast swathes of their business and basically go broke. What they can do is say that they brought about the royal commission, but any and all of the bad stuff that came from it was legislated into existence by Bill Shorten and his cadre of inner-city latte-sipping sexually deviant communist pornographers (the nomenclature will need some workshopping). In a likely future Tweet from the Betoota Advocate folks, you’ll see some kind of reference to We Didn’t Start the Fire being rewritten from ScoMo’s POV (#ScoMoPoV). OK, but in the more likely other hand, we have a cast of muppets here who haven’t the foggiest idea what they’re doing. Every other one of them has one eye on the door (Tony Abbot has his eyes on the dunny doors at his local surf club…). They didn’t want the royal commission in the beginning, because you don’t bite the hand that feeds you, and the results of said commission are just too spooky for them to handle. And I don’t think you could trust most of them to sit the right way on a toilet set, much less enact admittedly complicated findings in a complex business into even more complicated legislation in a legislative window so small you could barely fit Peter Dutton’s social conscience in it. Same thing here. Call it Apocalypse May.